A new type of still life, of the mid-eighties, with luminous high-keyed colors throughout, in the background as in the objects. The relations of intensities and pure hues come to the fore. In spite of the greater brightness, the small differences count for more in the harmony and expression of the whole. The sensitiveness is a marvel; to reproduce it perfectly is impossible. Together with the richness of hues goes an incredibly refined gradation of tones. The blue dominant, which is more than a local color--it is a prevailing mood--has a different quality in the vase, the wall, the platter, and the smaller units; observe the flowers and the blue touches on the table, which are contrasted with warmer neutral tones. The blue is an exhalation upward and into depth. The rich green is concentrated in space, the reds, yellows, and whites are in smaller scattered bits, the blue is diffused over a large area. The greys and neutralized tints are toned with yellow or blue in exquisite intervals. The arrangement is no less interesting than the color and just as refined. It is formal, very deliberate looking, through the dominant theme of the vase, set in the middle between verticals; and through the calculated, naively stiff alignment of objects beside and behind the vase, as if in prescribed rows, parallel and frontal, like pieces on a chess board. But against this apparent rigidity plays the expansive lyrical movement of the bouquet, with its shapeless spots, reaching out to the limits of the space (yet the red, green, white, and blue spots maintain in their positions the perpendicular scaffolding of the whole). 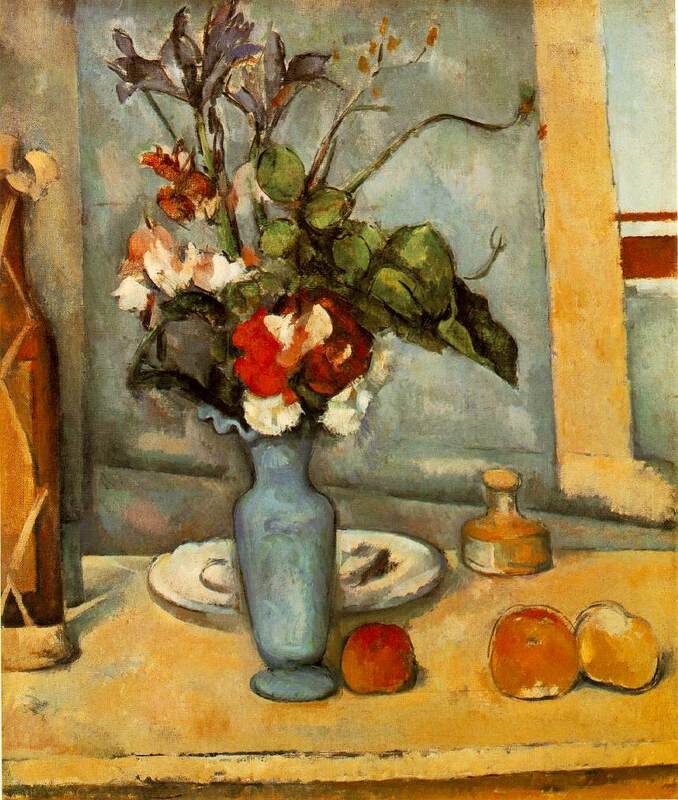 The formality is challenged, too, by the strong diagonal behind the vase, so sensitively broken near the vase's edge, and by the details of execution--they are amazingly free, like the details of a distant landscape, yet are so near that one object--the bottle--is cut by the frame. The fine scalloping of the edge of the plate is a pure painting variation in contrast to the smooth strong curve of the vase's shoulder, but seems inspired by the wavy mouth of the same vase. The many tiltings and discontinuities soften the severity of the architecture of the whole. In the fruit, the outlines lie partly outside the object. Such disengaged strokes deny the substance of things and make us more aware of the artist at work--a wonderfully delicate, scrutinizing, weighing, balancing, eye and hand.